Being a teacher is one of the many hats that graduate students across the country wear during their career. As a graduate student who has taught several science courses, I know that keeping students engaged is always a challenge, particularly in required and introductory courses. While I have taught different levels of undergraduates, from freshman to seniors, I faced my most daunting challenge yet last summer: piquing and maintaining the interest of high school students in my introductory zoology course. Students from my FSM zoology class (left) observe and interact with an adult sea urchin that I am holding (right) during one of our laboratory activities. Image credit: Kat Munley, FSM. Following my first year of graduate school, I had the privilege of being an instructor in the Foundations in Science and Mathematics (FSM) program, which offers two-week summer classes to help advanced middle and high school students prepare for upcoming science and mathematics courses. Organized and taught by current IU graduate students, the program creates a great opportunity both for high school students to learn about exciting topics in science and math from up-and-coming researchers in their fields and for graduate students to further their teaching and mentoring skills. Although I have years of experience teaching undergraduate students, I admit that designing and teaching a practical yet engaging course for high schoolers is no small feat, especially one that takes place during the summer. This task proved to be even more difficult because of the diverse age range of my students: my youngest student during last year’s program was 11 years old, while my oldest student was 17. Furthermore, instructors must design their courses to fit the program’s short time frame since all classes meet for only six hours per week for a mere two weeks. I first thought that introducing my students to the vast diversity of the animal kingdom without losing their interest seemed nearly impossible within such a brief period of time. However, after a lot of brainstorming and strategic planning, I found that the secret to keeping my students engaged in the classroom was to provide them with active, hands-on experience. 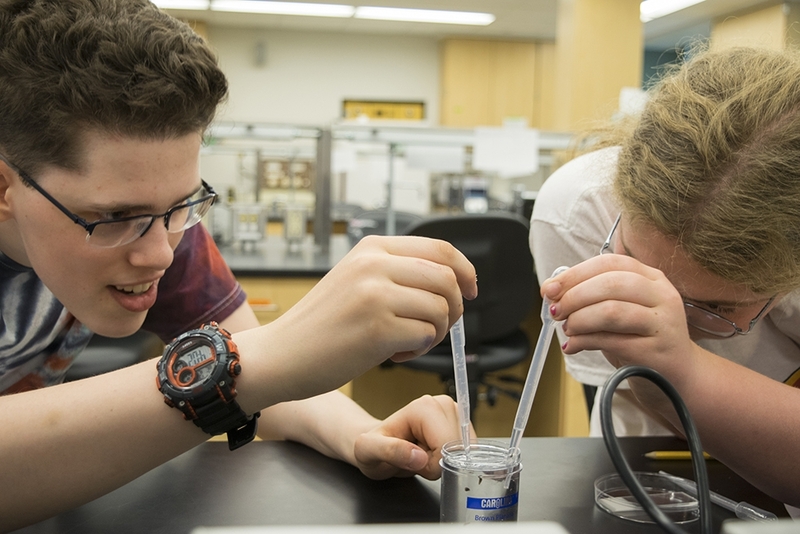 FSM students Matthew Crome (left) and Willow Shoemaker (right) use pipettes to transfer microscopic flatworms, called planaria, to watch glasses during my zoology class. Image credit: Emily Eckelbarger, Indiana Daily Student. For my zoology course, a typical two-hour long day in the classroom consisted of a careful balance between lectures and laboratories. One of the key elements of my course was including interactive demonstrations and laboratory activities, which allowed my students to apply the information they learned in the classroom and develop problem-solving skills. The use of hands-on activities is a common theme among many FSM courses, and previous students have participated in mock crime scene investigations in a forensic science class, toured IU’s Kirkwood Observatory in an astronomy class, and developed and tested their own computer simulations in an introductory programming class. 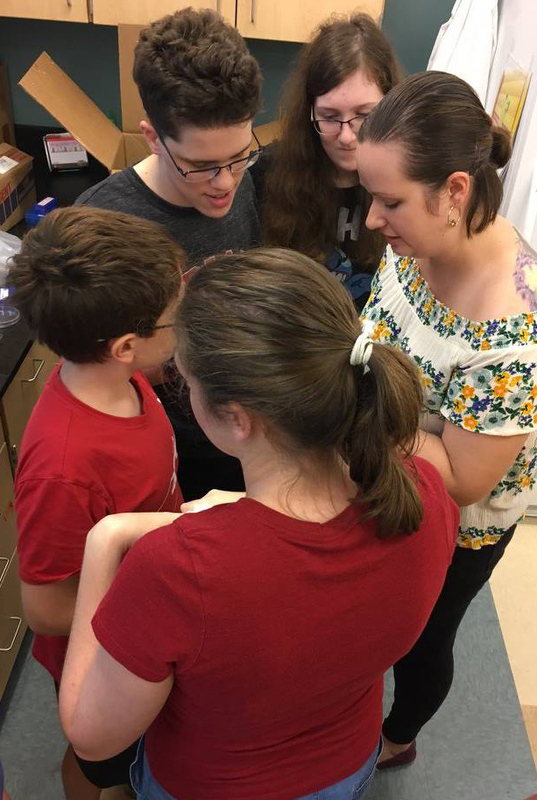 Last summer, my students not only examined preserved animal specimens under the microscope but also interacted with live animals during most of our classes, including upside down jellyfish, microscopic flatworms, sea urchins, and brittle stars. 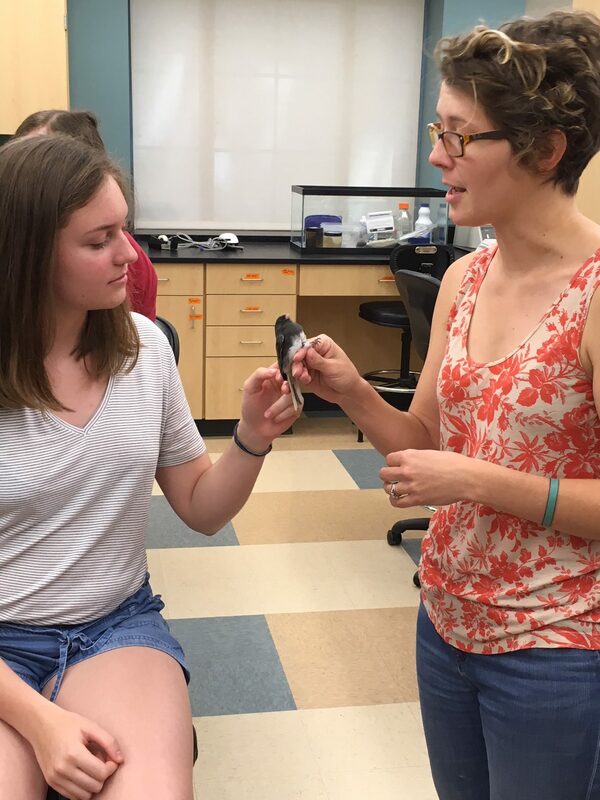 Foundations in Science and Mathematics student Grania Whelan (left) interacts with a dark-eyed junco during my zoology course. Dr. Christy Bergeon Burns (right), a former graduate student in Dr. Ellen Ketterson’s lab in the Department of Biology, was one of several scientists I invited to serve as guest instructors for my class. Image credit: Kat Munley, FSM. In addition to our animal guests, my students also enjoyed the visits and demonstrations provided by other faculty, students, and staff from the Department of Biology. They had the pleasure of meeting and speaking with some of IU’s most illustrious biologists, including Dr. Armin Moczek and members of Dr. Ellen Ketterson’s lab. Having the opportunity to observe the awe and excitement that my students expressed when they held live snakes and birds and to listen to the thoughtful and creative questions they asked our guest instructors were among my favorite memories from last year’s FSM program. Taught by a handful of enthusiastic instructors including myself, the upcoming 2018 FSM program is packed with a variety of courses, from introductory biology, chemistry, physics, and mathematics to more specialized and advanced courses in zoology, food science, brain science, astronomy, forensic science, evolution, and computer science. The second session of this year’s program will run from July 9 to 20. Registration is currently open, and students can register until the first day of classes. For more information or to become involved with the program, contact the FSM administrative team at fsm@indiana.edu or visit the FSM Facebook page.